Emerald Media - Five minutes with David Fletcher. James Bourne interviews David Fletcher Managing Director FlairJet. DF -- It was actually through my wife Angie. She was a purser with Pan Am before joining United in 1991. I always liked the thought of flying; I just thought it was something other people did as nobody in my family had ever been in aviation. She encouraged me to fly and fully believed in me. The culmination of all the hard work we both put in, was the first time I flew the Airbus as a Captain for Monarch. I'm very fortunate to have flown various jets: from a Phenom 100 to an Airbus A330. I thoroughly enjoyed my 13 years with Monarch prior to setting up FlairJet. JB -- How has your background as a pilot helped your current career in aviation? DF-- Immensely, it's given me a complete understanding of every role within the business. Pilots are the driving force behind any company and they're also its public face. I think what I've been able to do with my experience, sitting at the front of the aircraft as both a junior First Officer and latterly as a senior Captain, is to help my team understand the focus I want the company to have. JB -- In the early days, could you have imagined that FlairJet would grow into what it has become and do you take time to appreciate it? DF -- I always felt that if we got the right team we would be unstoppable. As soon as Gerry (Rolls), Mike (Chamberlain) and David (Taylor) joined me, I knew that the core of that team was in place. I work hard so it's difficult to take time out to enjoy it. The analogy I'll give you is when you drive from A to B and you just don't remember the journey; no landmarks or points of interest, just the destination. I do constantly try to enjoy the journey, but it's difficult. Maybe once a year when we get together as an extended team, say at Christmas and I'm gathered round a big table with my team and their partners, I do sit back and appreciate that this is a family that we've created. That's when I appreciate it, but it's very rare that I get the chance. JB -- In such a crowded space as aircraft charter is it tough to differentiate? How do you get your message across? DF -- It's very difficult to get your message across because everyone is trying to give the same message. Messages like 'professional and safe' are a given in our sector. So a lot of it is for us is about the proof in the pudding, that personal attention, word of mouth and by being consistently good, professional and customer orientated. Of course have such a hugely respected company like The Marshall Aerospace and Defence Group behind us helps! JB -- Authenticity as a leader is said to be very important. As a leader yourself what characteristics do you value most highly? DF -- The most important thing for me is I would never ask anyone to do anything that I wouldn't or haven't done myself. I think that's vital. The advantage of starting out with a very small team was that in the early days we all did everything. I think if people look up to you and trust you because they believe what you say, then you'll have a team that will follow you anywhere. That's what we've created at FlairJet. DF -- Two pieces really. One is to never give up; the second is to only ever worry about the next step. 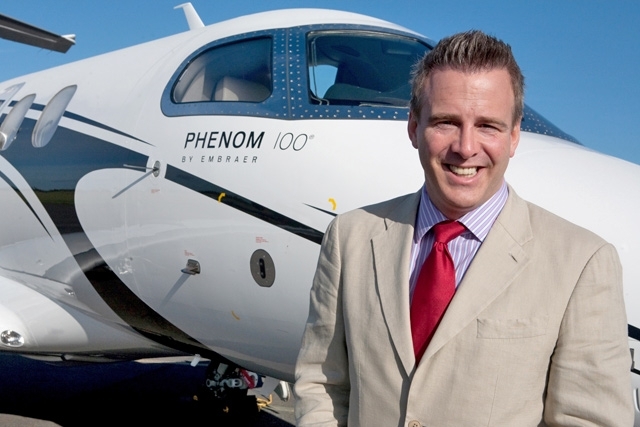 When I said to people in 2008, at the start of the recession and having never been in business aviation before, that we were going to start an AOC company, be the first operator of the Embraer Phenom 100 and 300 (which at the time weren't even in Europe at the time) and get our AOC within six months, they must have thought I was mad. But we did all this because although we had this ultimate goal as the target but only ever worried about the next step. You don't have to climb the mountain in one day. Hobbies: Don't have the time, watching my son play rugby is as close as I get!